For the fourth time in as many years, the Mighty Oaks men's cross country team won the United States Collegiate Athletic Association (USCAA) Cross Country National Championship. The ESF women's team finished third. The top three colleges in the men's 8K were ESF, Dine College, Tsaile, Ariz., and Alfred State, Alfred, N.Y. In the men's race, the overall fastest runner of the day was ESF team captain Tim Callahan with a time of 26:46.3. Four of the top 10 men runners were from ESF. Dine College took first place in the women's 6K race with Cleary University, Howell, Mi., second and ESF in third. The top ESF woman finisher was senior Cambria Ziemer. Callahan said, "I knew it was going to be competitive this year, but we know the course and were well-prepared." "Knowing it was my last race as a cross country collegian, I thought about my teammates, my coaches and family all while I was trying to catch up with the first place runner," Callahan said. Coach John View was pleased with the day's results. "I knew both men and women would be pressed very hard by the teams that were here. I couldn't be happier with another national championship for the men and third place for the women." More than 350 of the nation's best collegiate cross-country runners converged in Syracuse Nov. 7 for the 2014 championship. Athletes represented more than 60 colleges from across the United States at the two-day event happening at Drumlins Country Club. 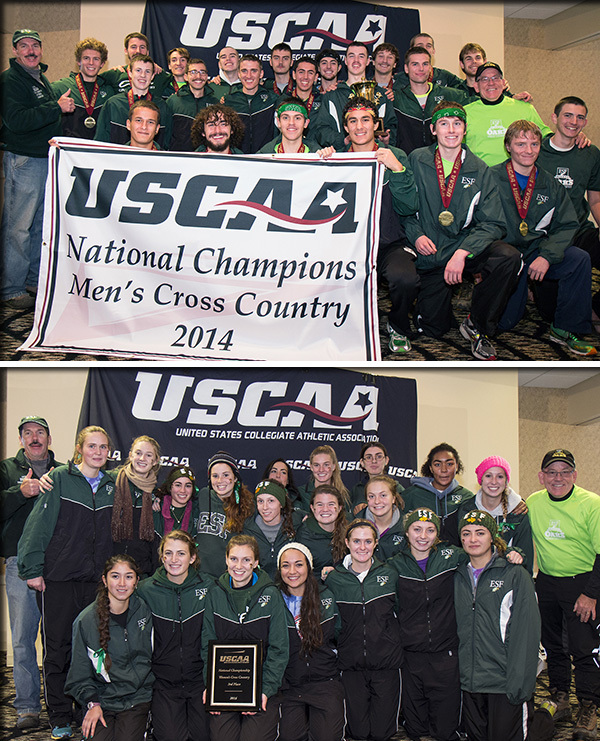 The USCAA Cross Country National Championships was hosted by ESF with assistance from the USCAA. This marked the second time Syracuse was selected to host the USCAA Cross Country Championships.